These colorful, seasonal vegetable buns are so good, everyone will come back for more! We served them at our 30th Anniversary Party on April 26th! To make the dressing, cut each cherry tomato in half and scoop out the seeds. Cut the 4 oz. feta in 1 inch pieces. 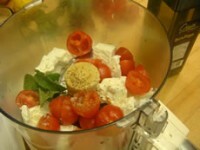 Put the tomatoes, cheese, mint leaves, lemon juice in the container of the food processor. Blend until smooth. With the machine running, pour in the olive oil. Transfer to a bowl, taste, and season with salt and pepper. 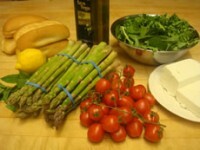 To prepare the vegetables, rub the asparagus with olive oil and sprinkle with salt and pepper. 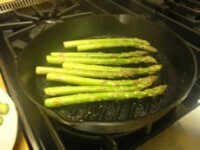 Heat a grill or cast iron pan until very hot. 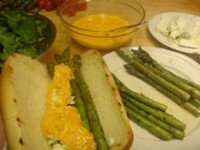 Grill the asparagus on all sides. Cut the remaining tomatoes in half and toss with the lemon juice, mint leaves, and olive oil. 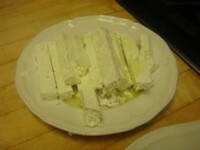 Cut the feta into 1/2 x 1/2 inch sticks and coat with olive oil. 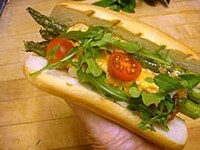 To make the final dish, slice the hot-dog buns in half and lightly toast, fill with asparagus, a few tomatoes, a large spoonful of the cherry-tomato vinaigrette, and a small handful of the arugula.